Asialink Arts is proud to participate in the Setouchi Triennale, 2016. The arts festival takes place across 12 islands located in the Seto Inland Sea, Japan. Artist Naomi Eller has developed a site specific project to coincide with the official summer festival launched on the 18th of July, exhibiting work alongside artists from Korea, Indonesia, Thailand, Hong Kong and Taiwan. Naomi's exhibiton has been curated by fellow 2016 Asialink Arts Resident Joanna Bosse. Nature is often described as the provider of food and water essential to life. Australian artist Naomi Eller’s work for Fukutake House Asia Art Platform considers the equally important role that nature plays to provide us with spiritual sustenance, giving emphasis to the nourishment of the soul that is also an essential ingredient of a balanced and fulfilling life. Eller’s work takes ideas around the spiritual significance of stones in ancient cultures and applies this in a local context. Her large-scale collage, titled Language of stone: Fukuda, includes photographs taken during her time as an artist in residence in the Fukuda community. These photographic recordings are placed within a vast panorama that echoes a form of ancient scripture, or language. Stones inhabit a landscape that is both eternal yet ever-changing; here, stones are like individuals within a community who join to make families and groups or detach to embark on single journeys. Eller’s work reflects on the history of the region and the ways that communities sustain themselves over time. 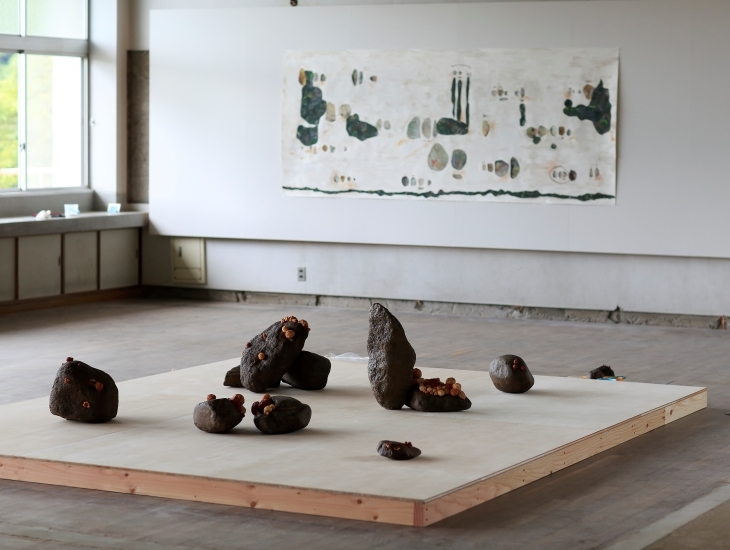 Eller’s sculptural installation comprises local river stones joined with ceramic pieces. These forms are in a process of becoming something new – the growths sit in the crevasses and natural cracks of the stones and could be self-generated or a consequence of external influences. Like the ancient Japanese practice of Kinsugi, they highlight change. This work comments on the effects of globalization, as a force that blends and transforms places and cultures, at times creating beautiful and productive mutations and at others becoming a destructive force that eats at the heart of what makes a place unique.